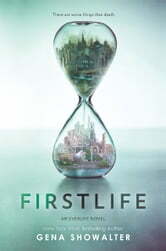 From the author of the New York Times bestselling White Rabbit Chronicles series comes book 1 of a brand new series in which life as we know it is merely a dress rehearsal, and real life begins after death. who has spent the past thirteen months locked inside the Prynne Asylum. The reason? Not her obsession with numbers, but her refusal to let her parents choose where she'll live-after she dies. Really enjoyed this book. Very unique story. It was hard to piece together what was going to happen because it is so different. Haven't enjoyed a story like I did this one in a long time. I'm a sucker for a bit of hard earned romance aswell haha. Hope the others go on sale so I can keep enjoying! Definitely would recommend. Ten is a character different from other teenage protagonists I've ever read about. She makes it a different story than I thought. Her stubborness not to choose, despite torcher,is amazing. Just saying , in the end, she chooses... NOT TELLING! 50 pages in and I had to stop. Awful description, no explanation, cliché and boring characters. No thank you to this book. Ten. Nine. Eight... The countdown begins as Tenley Lockwood has to decide on one of the realms. Both realms hae both pros and cons. Light:Darkness and Right: Wrong. I thoroughly recommend this book. Please read it and write a review to let us know what you thought.